In the waning weeks of the Civil War, the riverboat Sultana departed New Orleans with a load of livestock and passengers bound for St. Louis. Having developed a leak in one of its boilers, the ship stopped in at Vicksburg, Mississippi for some makeshift repairs to replace the leaking boiler plates. Following this stopover, the ship proceeded upriver against the strong spring currents of the Mississippi. Aboard the ship were hundreds of recently released Yankee POWs making their way home from Confederate prison camps. On the evening of April 27, 1865, as the ship’s crew piled on steam to overcome the Mississippi’s currents, a massive explosion ripped through the wooden bowels of the ship and set the entire vessel aflame. 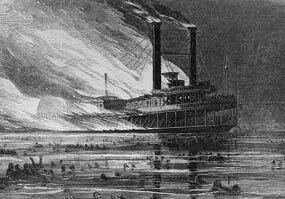 Ablaze and adrift, the Sultana ran aground on the west bank of the Mississippi near present-day Marion, Arkansas. Despite the efforts of several rescue ships, hundreds perished in the frigid waters of the Mississippi from hypothermia or drowning. Dozens more were killed by the initial explosion and subsequent fire. Most of the survivors were taken ~9 miles downriver to Memphis where another ~300 died from their burns. The official death tolleventually reached 1,547, however, estimates have ranged as high as 1,900. Regardless of which figure is correct, the sinking is to this day the deadliest maritime disaster in US history. Despite its high body count, the Sultana’s sinking, both in 1865 and in a historical context, has often been overshadowed by President Lincoln’s assassination and the conclusion of the Civil War.